I like Old Spice. For Christmas I received a vintage Old Spice cobalt blue mug. I want to put an Old Spice scented soap in it and am looking for recommendations. I have Stirling Spice in another OS mug. I love the soap and enjoy the scent but was wondering about other options. I tried MammaBear Aged Spice but discovered her soaps irritate my skin so they are out. Any other good Old Spice type soaps out there? My first choice would be to track down a vintage Old Spice puck on flea-bay. My second choice would be "Spice Trade" from Wickham/Huntlee. (12-29-2014, 11:51 AM)SharpSpine Wrote: Soap Commander Endurance. Seconded. I was surprised how spot on the scent was. And the performance was even better. Grab a vintage puck of Old Spice while you still can. There are still available and eventually us hoarders will deplete the existing stock. Thanks everybody for the suggestions. Appreciate it. Post a photo of the mug! (12-30-2014, 06:06 PM)sch1989 Wrote: Post a photo of the mug! 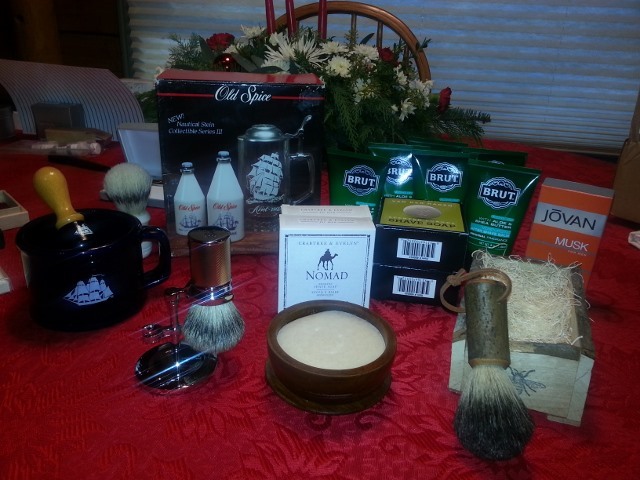 This is the pic I posted on the "December Monthly Haul"
Wickham Spice Trade the soap's a good match for the Old Spice aftershave.